Hi Everyone - I am looking for opinions on the Camp Chef BBQ Box with hinged lid. I have the two burner explorer stove and thought this might be a good solution over buying a stand alone grill. Does anyone have experience with one? A buddy of mine bought one. Limited when cooking out as you loose the burners for other stuff like corn or a boil. He takes his grill now and the BBQ box sits at home. I was only looking at the single burner version so I would still have one burner available. Beyond the loss of the burners did your friend like how it cooked? Found it was OK for less greasy foods, burgers and sausage tended to flare up a bit, lean cuts cooked just fine and as well as smaller gas grills a lot use. I have the 3 burner Camp Chef and the grill box. Not my favorite. The grill box cooks very hot and flares up. I have 2 big Holland Grills at home and I am used to cooking with the lid closed and no flare ups, so it could just be operator error on my part. I have had the Big Gas Grill for 2 or 3 years now and still have issues over cooking everything. I do like the room, cooked for a crowd this past weekend at Twin Lakes CG in SC when my niece graduated from Clemson. Just bought a Weber Q2200 for when it is just the DW and me. You can read lots of reviews on Amazon for the Hingeless Version BB100L and also for the Hinged Version BB30L. With that said, I have been thinking about going with a dedicated grill box. They look nice and I like the lid. I'm not sure I need it, though. Attached at the bottom of this post is are two live action shots of me using my griddle/grill. Best chicken I've ever grilled comes off this rig. Great grill marks on chicken and steak, if you like the cosmetic side of grilling. Also, if you haven't done so, get some side shelves. They are absolute game-changers. Thanks for the good info. I do have the shelves, another nice upgrade when using a griddle is the leveling feet. 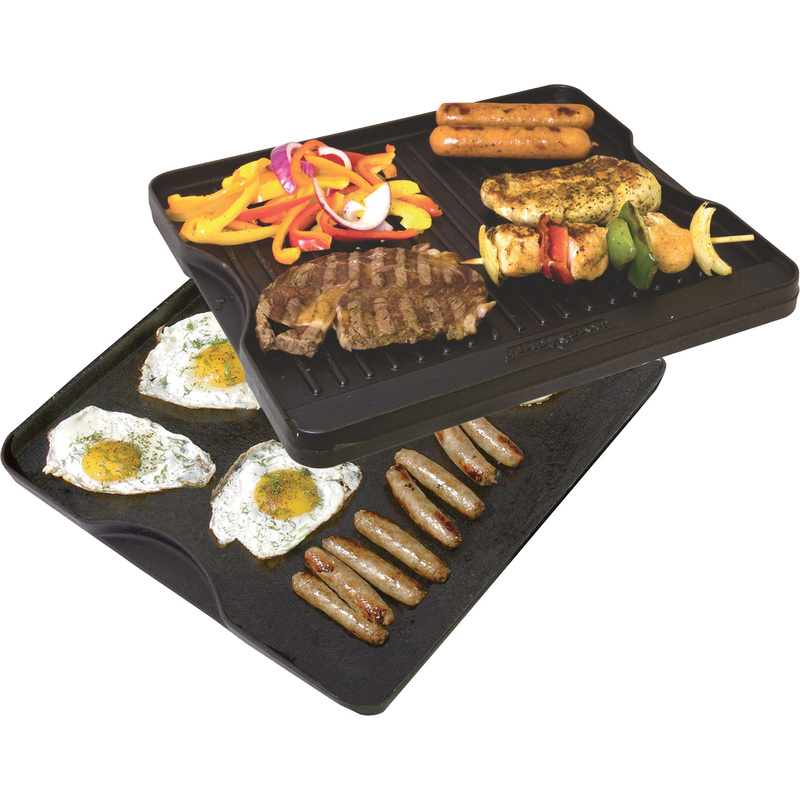 I have the two burner griddle and I love it for breakfast, fajitas, stir fry, and lots of other stuff. I am looking at the BBQ because of the lid mostly, I also am a huge cast iron fan and the grill will replace a "grill" skillet. But I usually only have to cook for the 2 of us. The DW hates the Camp Chef setup though. We have the Big Gas Grill with the BBQ Box. We like the bbq box, but it is a PITA to clean for storage. Like others, we did have flare-ups, but it was mostly learning to control the burners. I have the exact box you want. I have only used it a couple of times as I just got all my camp chef stuff for Christmas. And I absolutely love it. Coming from a small stand alone grill this was a big upgrade in my opinion. I also have the single burner griddle. I haven’t even used it camping yet but I can say I’ll never go back to anything else.